"Monirobo is designed to operate at radiation levels too high for humans. The 1.5-metre robot runs on a pair of caterpillar tracks and has a manipulator arm for removing obstacles and collecting samples. 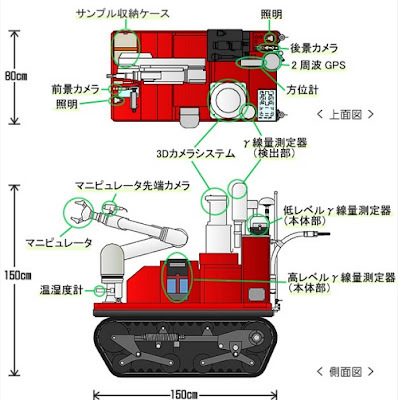 Sensors include a radiation detector, 3D camera system and temperature and humidity sensors. It can be operated remotely from a distance of about a kilometre. Monirobo weighs some 600 kilos and is limited to a speed of 2.4 kilometres per hour. It has to carry heavy shielding because many electronics, especially cameras, are highly vulnerable to the effects of radiation. The robot was developed by Japan's Nuclear Safety Technology Centre in association with the Ministry of Economy, Trade and Industry after the Tokaimura nuclear accident in 1999 in which two workers died. The machine now in use is Red Monirobo; a Yellow Monirobo, which has tools for collecting dust samples and sensors for flammable gas, is expected to be deployed within the next day or so." Finally. This doesn't excuse the unfathomable stupidity of the original flawed design, but at least the Japanese are now bringing in the power tools made by Mitsui.